Creator: Watson, Horald V., 1901-1977. Abstract: The Horald V. Watson collection includes one set of Daisetta water control records, two prescription sheets from Bell’s Pharmacy and Drugs, an official pocket seal, and photographs of Batson, Hull, Daisetta, and Galveston, Texas, dating 1917-1920s, about 1940, 1954, 1957, undated. 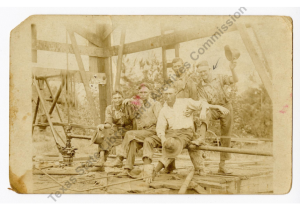 Photographs from this collection have been digitized and are part of the Texas Digital Archive. A description of non-electronic records described in this finding aid are available at http://www.lib.utexas.edu/taro/tslac/50116/tsl-50116.html. Images are in order as they were received. Horald V. (H.V.) Watson Sr. was born June 22, 1901. A native of McGregor, Texas, he moved to Hull, Liberty County, Texas in 1935. He owned and operated the Quality Drug Store until his retirement in 1971. He was a member of the Methodist Church, Batson Masonic Lodge, and the Hull Rotary Club. He was married to Mary Allene Allen, and they had three children: Mary Ann, Ellen, and Horald Jr. H.V. Watson Sr. died on August 21, 1977. The Horald V. Watson collection includes one set of Daisetta water control records, two prescription sheets from Bell’s Pharmacy and Drugs, an official pocket seal, and photographs of Batson, Hull, Daisetta, and Galveston, Texas, dating 1917-1920s, about 1940, 1954, 1957, undated. The photographs were either collected or created by Watson, an employee of Dr. Bailey’s Drug Store. Images are of Dr. Bailey’s Drug Store and buildings around Hull; the road from Daisetta to Hull; the Hull and Batson oilfields, including workers and various equipment; and landmarks in Galveston, including the John Sealy Hospital and Sidney Sherman Square. Two later photographs are of buildings in Hull from about 1940. Materials do not circulate, but may be used in the Sam Houston Regional Library and Research Center reading room. Materials will be retrieved from and returned to storage areas by staff members. Researchers are required to wear gloves provided by the Sam Houston Regional Library and Research Center staff when reviewing photographic materials. Clyde and Thelma See glass plate negative collection, about 1905-about 1920, 2.5 cubic ft.
L.J. Whitmeyer glass plate negatives collection, about 1890-about 1910, 0.75 cubic ft.
(Identify the item), Horald V. Watson collection. Sam Houston Regional Library and Research Center, Texas State Library and Archives Commission. These records were donated to the Sam Houston Regional Library and Research Center by Mrs. Ellen Pickett on January 18 and August 21, 1978, and by Allene Allen Watson via Mary Ann Calhoon on January 10, 1992.